We hope you never need us, but if you ever do, we’re here for you. Voted Best of the Best Body Shop Collision Repair Center for 2016 and 2017! At Harry Robinson’s Body Shop we do repairs from minor touch ups to major wreck repair and warranty paint repairs. We work on all makes and models of vehicles, accept all insurance, and handle repairs directly with the insurance company to ensure your body shop experience is as smooth as possible. We are proud to be providing quality collision repair to Fort Smith & the entire River Valley since 1984. Let us Handle the Hassle! Call us!, Stop by 5912 S 36th in Fort Smith off of exit 11 I-540 next to Harry Robinson Buick GMC, or click to make an appointment. Harry Robinson’s Body Shop performs collision/wreck repair, hail repair, minor touch ups, cosmetic enhancements and paint-less dent removal on all makes and models. We have experience with all manufacturers and provide warranty paint repairs for other dealerships that don’t have body shops. Our Body Shop has earned its reputation by providing quality collision and repair work for years. We are proud to be local people serving local people since 1984. 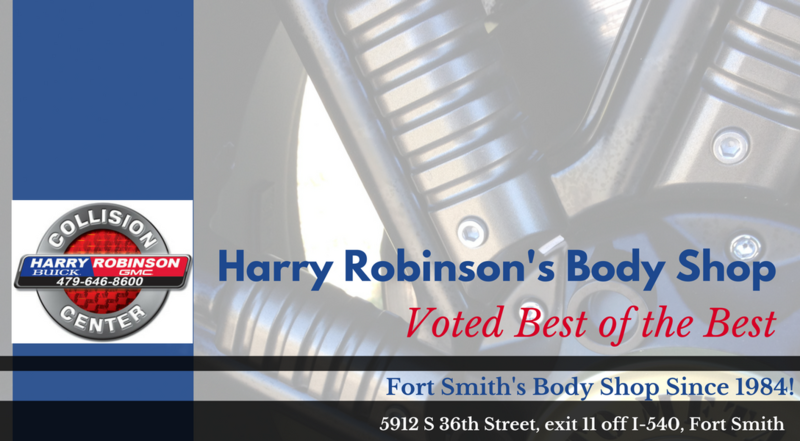 Harry Robinson’s Body Shop has gained recognition over the years for excellent technical skills and outstanding customer service in collision wreck repair. We employ only top certified technicians as well as professional office staff. We are a direct repair shop. Meaning we handle negotiations on repairs with the insurance company for our customers. Arrangements for towing and rental services can be made when needed. Our waiting area is Clean and Comfortable. Your Rights: You have the right to select your own repair facility. Estimates may vary – and a lower estimate may not include necessary repairs to return your car to pre-collision condition. Call us! or email today for your Free Estimate! Appointment. Contact Us. Check Status Repair.